After intensive testing and hack, we started using Semi-Synchronous MySQL Replication at Facebook production environments. 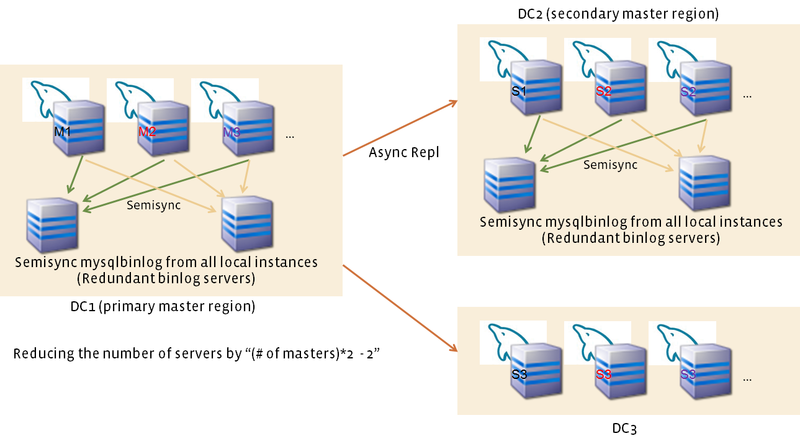 Semi-Synchronous Replication itself was ready since MySQL 5.5 (GA was released 3.5 years ago! ), but I'm pretty sure not many people have used in production so far. Here are summary of our objective, enhancements and usage patterns. If you want to hear more in depth, please feel free to ask me at Percona Live this week. The objective of the Semi-Synchronous Replication is simple -- Master Failover without data loss, without full durability. There are a couple of fast slave promotion (master failover) solutions. My own MHA covers both fully automated and semi-automated MySQL failover solution. Fully automated means both failure detection and slave promotion are done automatically. Semi automated means failure detection is not done but slave promotion is done by one command. Time to detect failure is approximately 10 seconds, and actual failover is taking around 5 to 20 seconds, depending on what you are doing during failover (i.e. forcing power off of the crashed master will take at least a few seconds). Total downtime can be less than 30 seconds, if failover works correctly. I'm using term "Fast Failover" in this post, which includes both automated and semi-automated master failover. In MySQL 5.6, GTID based failover is also possible. Oracle's official tool mysqlfailover automates MySQL master failover using GTID. The latest version of MHA also supports GTID. Both mysqlfailover and MHA rely on MySQL replication. MySQL replication is asynchronous. So there is a very serious disadvantage -- potential data loss risk on master failover. If you use normal MySQL replication and do automated master failover with MHA/mysqlfailover, you can do failover quickly (a few seconds with MHA), but you always have risks of losing recently committed data. If you don't want to take any risk of losing data, you can't do fast master failover with normal MySQL replication. You have to do the following steps in case of master failure. - Always set fully durable settings on master. By fully durable I mean setting innodb_flush_log_at_trx_commit=1 and sync_binlog=1. - On master crash, wait for a while (10~30 minutes) until the crashed master recovers. Recovery takes long time because it involves OS reboot, storage and filesystem recovery, and InnoDB crash recovery. - If the crashed master recovers, you can continue services without losing any data. Since all data exist on the master, slaves can continue replication. BTW official 5.6 had a bug causing all slaves broken in this scenario, but this bug was fixed in 5.6.17. - If the crashed master doesn't recover (H/W failure etc), you need to promote one of slaves to a new master. There is a risk of losing some data but you don't have any other choice. This "safer" approach has two issues. - Longer downtime. This is because you have to wait for master's recovery. - You can't eliminate risks of losing data. If master is dead and never recovers, your risk of losing data is the same as doing fast failover. If you do not care about data loss risk, there is no reason to use Semi-Synchronous replication. You can use normal MySQL replication and do fast failover with mysqlfailover or MHA. Facebook is one of the companies to care about data loss risk with MySQL, so that's why we were interested in Semi-Synchronous replication a lot. Semisync replication was originated from Google in 2007. Official MySQL supported from 5.5. Actual implementation algorithm was substantially different from Google's. Semi-Synchronous Replication currently has two types of different algorithms -- Normal Semisync and Loss-Less Semisync. Let me explain the differences. Loss-Less Semisync is a new Semisync feature supported in official MySQL 5.7. Original implementation was done by Zhou Zhenxing as "Enhanced Semisync" project, and also filed as a bug report. Oracle implemented based on his idea, and named Loss-Less semisync for it. So Enhanced Semisync and Loss-Less Semisync have same meanings. I say Loss-Less semisync in this post. On normal semisync(AFTER_COMMIT), committing to InnoDB is done before waiting for ack from semisync slave, so the committed rows are visible from applications, even though semisync slaves may not have received the data. If master is crashed and none of the slaves received the data, the data is lost but applications may have seen them. This is called phantom reads, and in many cases it's problematic. Loss-less semisync (AFTER_SYNC) avoids the problem. Loss-less semisync commits InnoDB after getting ack from one of semisync slaves. So when committed data is visible from applications, one of the semisync slaves have received that. Phantom read risk is much smaller: if both master and the latest semisync slave are down at the same time, data is lost. But it's much less likely to happen compared to normal semisync. To avoid data loss and phantom reads, Normal Semisync can't meet your expectations. Using Loss-Less Semisync is needed. When you do fast failover, you can set reduced durable settings on master as well as slaves. Reduced durability means innodb_flush_log_at_trx_commit != 1 and sync_binlog != 1. With Semi-Synchronous replication, you can immediately start failover when master is down. When promoting a slave to the new master, identify the latest slave (highly likely one of the Semi-Synchronous slaves but not guaranteed) and apply differential logs to the new master. Master's durability does not matter here, because there is no way to access master's data during failover. So you can safely reduce durability. Reducing durability has a lot of benefits. - Reducing latency on (group) commit because it doesn't wait for fsync(). - Reducing IOPS because the number of fsync() calls is significantly reduced: from every commit to every second. Overall disk workloads can be reduced. This is especially helpful if you can't rely on battery/flash backed write cache. - Reducing write amplification. Write volume can be reduced a lot, even less than half in some cases. This is important especially when using flash devices, because less write volume increases flash life expectancy. If you want to enable semisync always, you make sure these scenario won't happen. Set infinite or very long timeout, and have at least two semisync readers. Starting from MySQL 5.6, mysqlbinlog supported remote binlog backups, by using --raw and --read-from-remote-server. On remote binlog backups, mysqlbinlog works like a MySQL slave. mysqlbinlog connects to a master, executing BINLOG DUMP command, then receiving binlog events via MySQL replication protocol. This is useful when you want to take backups of the master's binary logs. Slave's relay logs and binary logs are not identical to master's binary logs, so they can't directly be used as backups of the master's binary logs. We extended mysqlbinlog to speak Semisync protocol. The reason of the enhancement is that we wanted to use "semisync mysqlbinlog" as a replacement of local semisync slaves. We usually run slaves on remote datacenters, and we don't always need local slaves to serve read requests / redundancy. On the other hand, as described at above "Requirements for Semisync Deployment" section, in practice at least two local semisync readers are needed to make semisync work. We didn't like to run additional two dedicated slaves per master just for semisync. So we invented semisync mysqlbinlog and use it instead of semisync slaves, as shown in the below figure. - semisync slave has lots of CPU overheads such as query parsing, making optimizer plans. semisync mysqlbinlog does not have such overhead. - semisync slave writes 2x (relay log and binary log). semisync mysqlbinlog writes binary log only. - For semisync slave, the way to write to relay log is not efficient. IO thread writes to kernel buffer per each binlog event. For regular auto-committed transactions, it consists of three binlog events (query BEGIN, query body, and commit XID). When using InnoDB only, writing to kernel buffer for every XID event is enough (though it does not cover DDL). By writing to kernel buffer for every XID event, it makes the frequency of kernel buf flush by less than 1/3. semisync mysqlbinlog could easily do such optimizations. We have not done yet, but it is even possible to make mysqlbinlog send back ACK before writing, to a file, and the extension is very easy. - Slave causes contention between SQL thread and I/O thread, so IO thread itself slows down, which slows down semisync master throughput too. Semisync binlog does not have such overhead because there is no SQL thread. With mysqlbinlog reader, master failover step becomes a bit tricky. This is because mysqlbinlog is not mysqld process so it doesn't accept any MySQL command, such as CHANGE MASTER. When doing master failover, it is highly likely that one of local mysqlbinlog has the latest binary log events, and the events should be applied to a new master. New MHA version (0.56) supported the feature. The performance drop was caused by "plugin_lock" MySQL internal mutex on master. For those who don't know, semisync is a plugin in MySQL, and it's not installed by default. The plugin_lock mutex was needed by semisync binlog dump threads only, but actually the mutex was held by all binlog dump threads. We looked into the problem further. First we tried replacing plugin_lock mutex with read/write mutex. It actually did not help much. But Linux profiling tools showed that plugin_lock still caused contentions. During profiling, we learned that most/all glibc rw-locks had an internal lock (mutex-like thing) on which threads could stall. The pattern was get lock, get exclusive access to cache line to modify data, release lock. This was relatively expensive for plugin_lock mutex, since it doesn't do any expensive I/O inside.